When I said I had no idea what I wanted to do with this site the other day, I lied. There are actually 2 things I (might) want to do. One of them is converting my aforementioned gaming spreadsheet into something more readable & usable on the web. Right now, entering a new game into that requires me to unhide a column, type things out, sort, then hide the column again. Updating one requires me to find it on the massive main list in order to make changes. It’s gross. The second thing is, I want to actually start writing about video games as a possible portfolio builder. I recently started editing a gaming podcast, and the itch to become part of the industry has been something sitting on my mind for years. In addition, this project would give me incentive to actually plow through the afore-mentioned spreadsheet of games and finish them. I’m going to preface this by saying yes, I have definitely played both of these before. 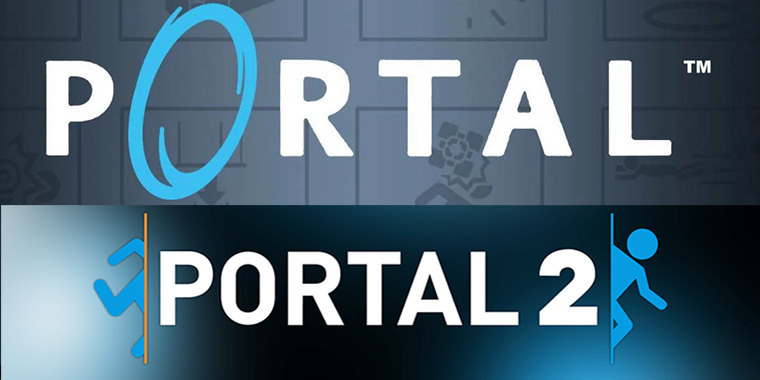 The first Portal is a game that I play maybe once every 1-2 years; a quick game that can be completed over the course of an evening. Portal 2, I haven’t played since it released in 2011, so it was a great opportunity to go back to. 2007 was a great year for new IPs in video games. BioShock, Assassin’s Creed, The Witcher, and Mass Effect all started that year. There were also some new installments of IPs with CoD4: Modern Warfare, Halo 3, Super Mario Galaxy, and Rock Band. With all these big names, it’s amazing that a small game like Portal is considered one of the best games of that year, but is still a quality game 11 years later. There’s no doubt that the graphics aren’t superb, but everything still looks really nice for a lightweight game that is over a decade old. Moving through the world feels great, with only a few odd bits with the portals themselves causing any issue. And the puzzles! Man, how great are these puzzles. I’ve played this game nearly 10 times at this point, and the puzzles never cease to impress me. This game is a genuine challenge, a great exercise for your mind, and even when you know exactly how to beat them, you can attempt to race through them as fast as humanly possible. Portal 2’s campaign is one of the best things I’ve ever played. The gameplay picks up right where you left off, and literally drops you back into very familiar environments all over again. With some added elements like bridges made of light, and some gels that make you bounce or run fast, the puzzle complexity has increased exponentially. I found myself saying “whoa” and “cool!” numerous times as I soared hundreds of yards through the air, bounced off walls, and progressed through the story. And oh what a story it is. Portal 1 is just… fine, story wise. There’s nothing to it. But Portal 2? It’s complex. It’s meaningful. It’s purposeful. It’s hysterical and terrifying and heartbreaking. Any character who speaks is bound to make you laugh at least once, from Wheatley’s incompetence to G.L.A.D.O.S.’s snark to Cave Johnson’s everything. And that doesn’t even cover the funniest line in the game. I didn’t get an opportunity to play through the multiplayer levels of Portal 2, but I recall being amazed by their complexity as well when I played through them with a good friend at launch. If you’ve never gotten the opportunity to play through those levels, find a friend and do it. If you thought the complexity of levels was high with one portal gun, imagine how crazy the game can get with two. Coupled with Portal 2’s added elements, the game just gets bonkers and amazingly fun. Literally my only gripe with the entire series happens right after you avoid being baked into a not-cake at the tail end of the first game. As you get into the back hallway, you’re presented with an elevated walkway and a door just barely cracked. There’s no prompt that you’re able to interact with this door and actually open it, and even as someone who’s played through the game numerous times, I always seem to forget that it can be opened. It’s a minor annoyance that always gets to me. Overall, it’s clear why the Portal games are considered some of the best of all time. Portal 1 shoved the entire gaming world forward in conceptualizing how physics and puzzles should work. Portal 2 took that already unique and interesting world, and gave us a terrific and compelling story to go along with it. These games are a great way to spend a couple hours, and I’m sure I’ll be back to do it all over again in no time at all. Did you enjoy this review? Did I skip anything important? Do you want to tell me how wrong I am? Use the hashtag #PortalReview when you message me on Twitter and let’s chat! Written on August 18, 2018. Posted under Review, PC.